You will be required to provide information at checkout necessary to process and complete your order. You are required to provide your credit card number, billing address and a shipping address. Upon completion of the checkout process, your personal information is securely forwarded to shop.franklloydwright.org. We use this information to fulfill your order and/or to contact you should questions regarding your order arise. Upon registration for an account or when you checkout at shop.franklloydwright.org, personal information will be stored in an area called “My Account.” If you wish to edit or update your information, including privacy settings, use the username and password you selected at registration to access “My Account.” Making a purchase will not automatically create a wishlist. If you have any questions or concerns regarding registration or account creation, please contact Customer Care at customercare@franklloydwright.com. From time to time, we may request your participation in a survey. Your participation is completely voluntary. Should you choose to participate, information we may request could include name, email address and demographic information (age range, zip code, etc.). Information you provide will be used to evaluate the function of our site and level of customer satisfaction in a range of areas. Our Customer Care Department is available to take your questions, comments and suggestions via phone or email. Contact information can be found on the shop.franklloydwright.org “Customer Care” page. It is our company goal and policy to read all messages and respond by the end of the following business day. Any information you provide in your correspondence is used to directly respond to the questions and comments you have submitted. To allow us to better serve you, you request that you provide as much specific information as you can. To improve our Customer Care, we may file your comments or decide to discard them upon review of your information. Your personal and sensitive information is of the utmost importance to us and we take every precaution to safeguard and protect your information. Whether you submit personal information online or offline, it will be protected. At shop.franklloydwright.org, we regularly review the website to make sure we are in compliance and have implemented the most current technology and industry standards. We want you to feel secure when you visit, browse and shop our site. We use a secure transmission (SSL) when you provide your credit card information. All credit card information is encrypted and stored on a server, which is not Internet accessible. Once your credit card information is stored, it cannot be displayed on our site. shop.franklloydwright.org does not condone or participate in the sending of Spam, unsolicited and commercial email. 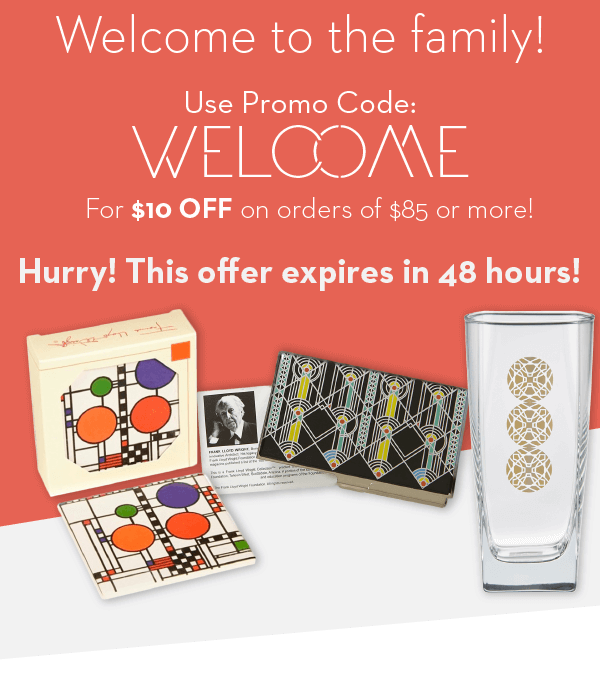 Only when you opt-in to receive email promotions from shop.franklloydwright.org will we send them to you. Also after opting in, we will only communicate with you via email regarding specific inquiries and orders you contact shop.franklloydwright.org about. By shopping at shop.franklloydwright.org or sending us an email, you are electronically communicating with us and in doing so are consenting to receive communications from us electronically as part of your shopping experience or in response to your inquiry. 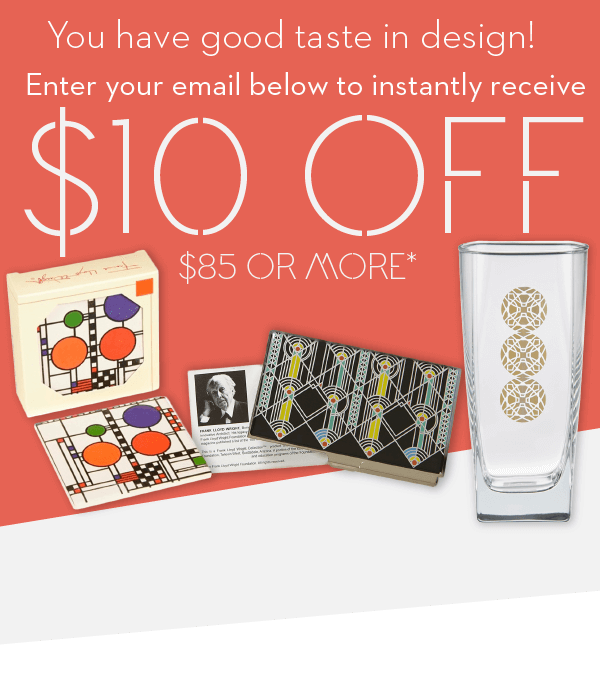 To opt-in to receive emails and promotions you may enter your email address at any time at shop.franklloydwright.org. Receiving shop.franklloydwright.org emails is voluntary and if you would like to discontinue receiving emails, you may unsubscribe at any time. o unsubscribe you can simply click the ‘unsubscribe’ button at the bottom of each email, by emailing customercare@franklloydwright.org or calling (269) 964-4600. Should we be required by law, or in the good-faith belief that action is deemed necessary, we may disclose personal information to comply with the edicts of the law or with the legal process served upon us. The State of California has passed California Proposition 65, which requires any product containing chemicals known to the State of California to cause cancer, reproductive harm or birth defects be specially labeled for consumers’ information. All product lead levels comply with FDA standards. Products will be marked accordingly, and Shop.AutismSpeaks.org is fully compliant with California's statute. Proposition 65 Warning for other identified products: May contain lead, which is a chemical known to the State of California to cause cancer, birth defects and other reproductive harm. After handling, wash hands. shop.franklloydwright.org works closely and very hard with our suppliers to design and produce products with the highest quality standards. We want you to be completely satisfied with your purchase, if you are not, please contact our Customer Care Department via email customercare@franklloydwright.com or phone (269) 964-4600.